Dreamy and surreal images, ripe with symbolism, gradually reveal to the viewer a world of multiple possibilities. Elisse Pogofsky-Harris worked mostly in oil on canvas. She spent 11 years studying and working in Italy, during which time she did aquatint etchings. Her work includes a series of paintings based on imagery found in the Old Testament, inspirations from and allusions to Japanese culture, and is strongly rooted in the iconography of classical art. In many of her works the subject is often an empty boat, a symbol that invites the viewer to enter into the picture and join the artist on her interior quest, a quest that blurs the boundaries between the concrete world and the inner world of longing, spirituality and mystery. 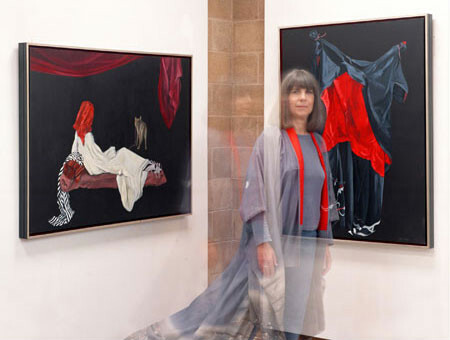 Her work has been exhibited in the United States and abroad and can be found in both public and prestigious private collections. Elisse Pogofsky-Harris’ documentation took place in 2004 and was sponsored by Paula Spellman. The FOTM Archive contains extensive information about this artist.